The Bauer National Collegiate Hockey Conference (NCHC) Players of the Week for the weeks of Dec. 16, 2016 through Jan. 1, 2017 include University of Nebraska-Omaha senior forward Austin Ortega (Offensive Player of the Week). Ortega is now a six-time NCHC Offensive Player of the Week, including three times this season, and has claimed seven career NCHC weekly honors. Ortega led Omaha to a home sweep of Lake Superior State, racking up four points in the two games while tying an NCAA career record. In Friday’s 4-1 victory, he scored the Mavericks’ second goal, which turned out to be the game-winner, giving him 23 career game-winning goals, which ties the NCAA career mark. He also posted a plus-3 rating in the series opener. 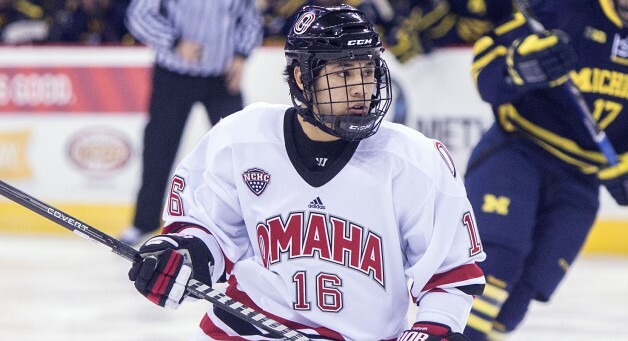 The following night, Ortega tallied three points, scoring a goal and adding two assists to help Omaha rally for a 5-3 comeback win, including assisting on the game-winner. He finished the weekend with two goals, two assists, a plus-4 rating and 12 shots on goal, including seven in Friday’s win. Ortega now leads all NCHC players with 27 points this season. Ortega played part of his youth career for the San Diego Jr. Gulls and the LA Hockey Club.